CD review: "Whisper of a Newborn Ghost"
This review first appeared in the October 26, 2006 issue of the North County Times. San Diego's K23 Orchestra is one of the more exploratory hip hop acts going  far closer to, say, The Brand New Heavies than any rapper you might name. Yes, the vocals by Al Howard are chanted  but they're chanted atop a recognizable melody. 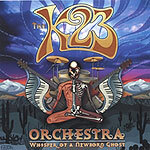 There's even an instrumental track ("Drifting Nexus") on the band's new CD, "Whisper of a Newborn Ghost." Oh, and the instrumental  written by guitarist Travis W. Daudert  is performed by a string trio before the whole arrangement seamlessly devolves into the next track, "Pulse." Nothing on this release seems random; there is a sense of purpose and vision here that reminds more than a little of the "concept" albums of the 1970s by bands like Pink Floyd or the Alan Parsons Project. As with those albums, "Whisper of a Newborn Ghost" is a work in and of itself, and not just a collection of songs thrown together. There's a narrative here that arches over the whole album. And if the messages contained in the lyrics are a bit dark and world-weary at times, they're also full of hope and positive energy. Daudert's electric guitar work has a pretty strong jazz vibe to it, while keyboardist Josh Rice Keys has an R&B groove to his playing. Drummer Steve Craft and bassist Matt LaBarber lay down a simmering funk backbeat that may vary in meter and tempo, but never in how rock-steady it is. If there's anything lacking here, it's a real hit  a song with a hook so strong you can't get it out of your head. Several tracks come close, but none really succeeds. Still, "Whisper of a Newborn Ghost" is far bigger than what most local bands could produce: It is a polished, fully realized work clearly the result of a shared vision and the talent to pull it all together.